Frogs are found in every continent except for Antarctica. There are an estimated 4,740 species of frogs worldwide, with 90 species in the U.S. When it comes time for mating, different species of male frogs have unique ways of capturing a potential mate's attention. For many species of frogs, a male's mating call is the most well-recognized method of attracting females. However, a simple chirp here and there is not enough to catch the attention of a female. Females look for males who go the extra mile. Some species prefer males who are able to multitask by making their calls longer and more frequent, which is quite a difficult task. Other species of females prefer males who call next to a pre-made nest. Females are on the lookout for males who go the extra mile when calling, since they presume these males are good quality mates. If the number of females available to mate with is low, this sometimes causes males to fight to protect their territories. For example, when a male black-legged poison dart frog (Phyllobates bicolor) calls for a female and another male responds to his call, the two males wrestle with each other. A similar feat occurs between two male golden mantella frogs (Mantella aurantiaca). If in the same territory with a female nearby, the two males fight, and the winner mates with the female. These wrestling matches can last for hours and demonstrate to the nearby female who is the stronger and braver frog. Female frogs sometimes consider appearance when in search of a suitable mate. A study published by the Association for the Study of Animal Behaviour on squirrel treefrog (Hyla squirella) sexual selection identified that female frogs would often choose males that have a larger yellow stripe on their sides over males with a smaller stripe. This yellow stripe is normally hidden by the legs of a resting frog; however, it becomes visible as the skin stretches when the frog calls, putting the stripe on display. It's possible that females prefer larger stripes because they reflect the male's mating quality, since healthy males can invest energy into developing pigmentation for larger stripes. 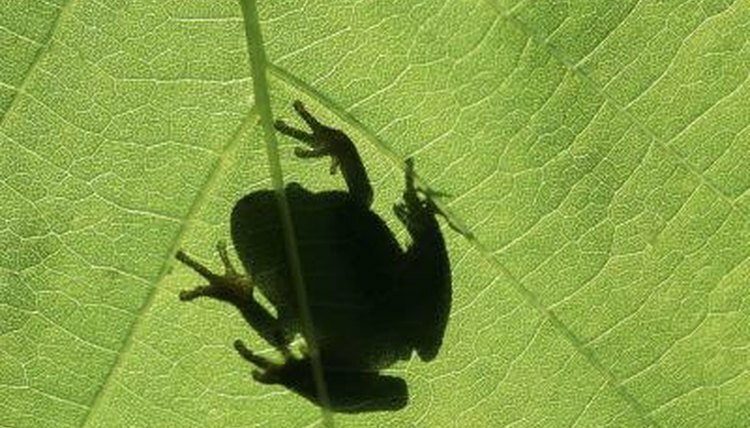 Sometimes female frogs are not picky at all when searching for a mate. This is especially true with the strawberry poison dart frog (Oophaga pumilio). Rather than judging potential mates on their calls, nest-building abilities or appearances, these frogs typically mate with the closest male. An explanation behind this behavior is that this species' females outnumber males, and if a female denies a male, she may not find another in time to fertilize her eggs. Although it may be a risk to mate with a male who might not have the best genes, these females can't be picky if they want their eggs fertilized.